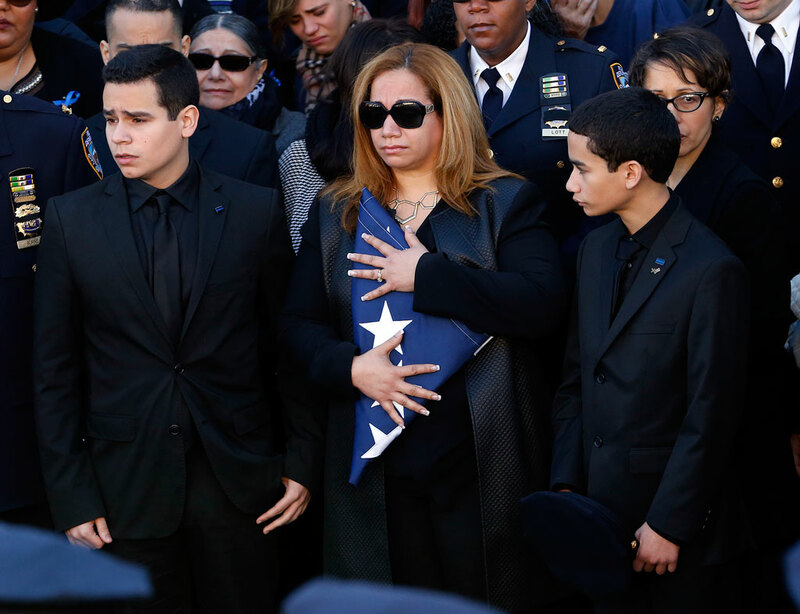 NEW YORK—An estimated 23,000 police officers, many traveling from other cities, paid their respects in Queens Saturday at police officer Rafael Ramos’ funeral, attended by Vice President Joe Biden. Ramos and officer Wenjian Liu were shot and killed in their police car in Brooklyn by 28-year-old Ismaaiyl Brinsley from Baltimore, Maryland, who then killed himself. The unexpected double assassination shook the NYPD. Heightened security measures were brought in to deal with the increased threat, including doubling up on patrols and extra protection for precinct offices. Liu’s funeral will be held after his family members in China obtain visas. The NYPD protected the right of freedom of speech even though they themselves were the target of false and abusive chants and tirades by some. “When an assassin’s bullet targeted two officers, it targeted this city and touched the soul of the entire nation,” said Biden, speaking at the service. “If we can see that our cops are people, see that our communities are filled with people like them too, then when we see each other, we’ll heal,” he said. The divisions were still on display on Saturday. When Mayor Bill de Blasio spoke, no officers outside the church clapped for him. Later when the mayor exited the church, walking past crowds of police officers, some officers kept their backs to him. Several NYPD officers declined to comment. New York City has seen weeks of protests against police brutality following decisions not to indict white police officers in Ferguson, Mo. and in Staten Island for murder in the deaths of black, unarmed men. Brinsley cited the black men on his social media posts, just before shooting Liu and Ramos. Gov. Andrew Cuomo complimented the police department on a job well done during difficult circumstances. Police officers inside the church, and the thousands crowded outside responded with sustained applause. I have 21 years, so I don’t want to be at another funeral. Outside the small church in the Glendale section of Queens were many thousands of mourners who could not fit indoors. At the center of the scene were the American flag, the New York State flag, and the Police Flag, with white stars on blue, and green and white stripes. Uniformed officers lined the streets, some wiping their eyes and noses discreetly, and bystanders gathered in crowds. Neighbors in the building across from the church looked on at the ceremony. A man holding a baby called multiple people to the window to look. A trumpeter played “America the Beautiful” and the loud growl of at least ten police helicopters flying overhead was audible throughout. When the ceremony finished, Ramos’ body was brought out, and the hearse drove off, followed by 260 motorcycles and streams of ambulances and public buses reserved for officers. The NYPD Emerald Society bagpipers marched to a drum beat at the end of the long procession. Ramos was laid to rest at Cypress Hills National Cemetery in Brooklyn. Everybody is valuable. We’re losing too many people to unwarranted violence. Marceda formerly worked for the NYPD for twelve years. “But there’s always that one lone wolf that could hurt you,” he added. Ramos had joined the police force at age 37, with more experiences and worldliness than the other younger recruits who looked up to him, said Bratton, speaking at the ceremony. When he died, he had been undergoing ten weeks of training to become a chaplain. He worshipped at the church where his funeral was held. Bratton named Ramos honorary department chaplain for the 84th Precinct where he had served. 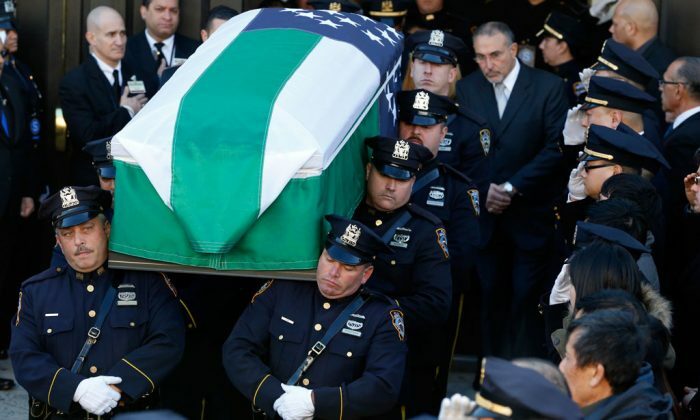 Both Liu and Ramos, who had been patrolmen, were posthumously promoted to first-grade detective. Jay Weatherspoon said she wants to join a K-9 unit working with police dogs when she grows older.